Google is said to have partnered with LG to manufacture the next-generation Nexus 5 smartphone for 2015. Several alleged photos of the upcoming handset had already been leaked online, but details about the new Nexus 5's hardware specifications have been harder to come by. That may no longer be true as new information about the much anticipated LG Nexus has surfaced online. A leaked specifications table has been circulated in tech rumor mills in the past couple of days. The table was posted by a familiar user on Weibo, a popular Facebook-Twitter hybrid and China's largest microblogging web site. The same user was responsible for sharing information about a handful of unannounced processors including the Apple's A9 and A9X chips, NVIDIA Denver 2, and LG NUNCLUN 2. These fresh details about the components powering the upcoming Nexus are a tad different from the limited information we observed from earlier leaks. Weeks ago, the LG Nexus 5 was said to come with 5.2-inch full HD screen with 1920x1080 resolution. It is also said to be integrated with an unannounced Snapdragon 620 (MSM8976) processor form Qualcomm. The new specifications table (see below) lists down different attributes. The same 5.2inch screen is now said to feature a 2K display with 1440x2560 pixel resolution. LG will apparently use a Snapdragon 808 processor complemented with 3GB of LPDDR3 RAM and Adreno 418 graphics processor. Most of those features are reminiscent of the specifications found on the current LG G4 flagship, especially the 2K display. However, due to the slightly smaller 5.2-inch display, the Nexus 5 2015 edition will pack a higher and sharper pixel density at 565ppi, as opposed to LG G4's 5.5-inch screen with 538ppi. On the photography front, the device will reportedly come with a 13-megapixel primary camera equipped with Sony's IMX278 sensor as well as OIS (optical image stabilization). 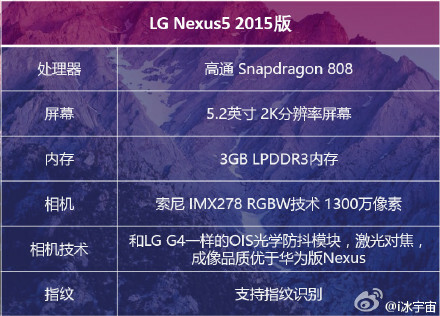 If this turns out to be accurate, it will be a step down from the G4's 16MP main camera. Nevertheless, the same source claims that the LG-mage Nexus' primary shooter will be better than the larger Nexus 6 from Huawei. Meanwhile, the next-gen Nexus 5 will include a better front camera with 5-megapixel sensor and f/2.0 aperture, based on a selfie taken and shared by a purported Google employee last week. Historically, the search giant unveils new Nexus models in the latter half of October. If the company sticks to that trend, eagerly waiting Nexus fans may finally see the official 2015 editions of the LG Nexus 5 and Huawei Nexus 6 weeks from now along with a rumored Nexus 8 tablet.